On June 14, 1999, Hank Aaron contributed an article about Jackie Robinson for a special section in TIME Magazine. Entitled “The Trailblazer,” the article presented a rare view of MLB’s first African American player through the eyes of the one man who could truly understand and appreciate what Jackie had endured because he too had experienced bigotry, cruelty and personal danger all for the sake of pursuing his dream to play Major League Baseball. 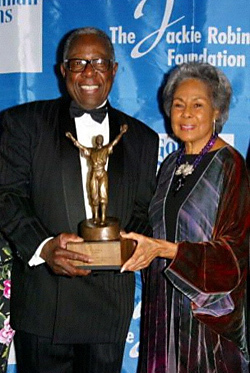 Years later, Aaron would himself be the object of fan adoration as he joined Jackie’s widow Rachel Robinson who presented him with the “Humanitarianism” award at the 2003 Jackie Robinson Foundation annual Robie Awards Gala at the Waldorf Astoria Hotel in New York City. Jackie Robinson had to be bigger than life. He had to be bigger than the Brooklyn teammates who got up a petition to keep him off the ball club, bigger than the pitchers who threw at him or the base runners who dug their spikes into his shin, bigger than the bench jockeys who hollered for him to carry their bags and shine their shoes, bigger than the so-called fans who mocked him with mops on their heads and wrote him death threats. The similarities between Aaron and Robinson continued even after their playing days were over. “After Jackie retired in 1956 and was elected to the Hall of Fame in 1962, he continued to chop along the path that was still a long way from being cleared,” said Aaron, who himself was referred to as the Ultimate Gentleman for his quiet dignity and perseverance to the cause of equality in major league baseball. Jackie campaigned for baseball to hire a black third-base coach, then a black manager. In 1969 he refused an invitation to play in an old-timers' game at Yankee Stadium to protest the lack of progress along those lines. Frank Robinson (who was related to Jackie only in spirit), finally became the first black manager in 1975. But Jackie was gone by then. His last public appearance was at the 1972 World Series, where he showed up with white hair, carrying a cane and going blind from diabetes. He died nine days later.